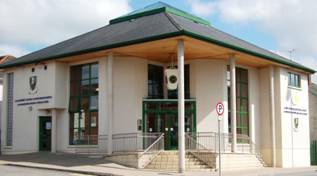 Since opening its doors in September 2001 Cootehill Library has established itself as a vital service at the heart of the community. It is a fully accessible building with a fantastic collection of books, audio books and large print books for all ages and tastes. Cootehill Library is a place to both relax and learn, with free Internet access, a study area for homework, a social area to read newspapers and magazines and of course it’s a place to meet with friends. Information and reference services are available. Staff are there to help with any query and are also on hand to demonstrate the range of Assistive Adaptive technologies for people with a visual impairment. The library building also has an events space which hosts exhibitions, readings, art workshops, reading group meetings, community and heritage events throughout the year. Next time you are in the area pop in – Cootehill Library is bound to pleasantly surprise you! An accessible parking bay is located at the front of the building. A packed programme is offered in the accessible Events Space. An Evacuation chair is in place. Staff is fully trained in its use. Assistive & adaptive technology is available including an Affinity CCTV Magnifier, Read Easy Scanner & Zoomtext software on PC’s. All staff are fully training and are happy to help. For the past 2 years Cootehill Library in partnership with the National Council for the Blind of Ireland (NCBI) has been hosting monthly coffee mornings specifically for people with a visual Impairment. These monthly meetings give NCBI clients an opportunity to use their local library, meet with people who have similar experiences, share ideas and allow them to use the Assistive Adaptive Technology. The coffee mornings have proved very popular and those who come along enjoy the opportunity to learn new skills, socialise and make new friends. Reading and study areas have been designed to accommodate people with disabilities. Online services include Ordnance Survey maps, Britannica Online, Irish Emigration Database and Irish Newspaper Archive. Cootehill Library is delighted to work with the HSE on the Bibliotherapy project. This project aims to promote mental health by recommending and making available quality self help books to enable people to help themselves. The books on the scheme were selected from recommendations made by doctors, psychologists and therapists and are now all available from Cootehill Library.